Y’all. It’s our 5th anniversary today. 5 whole years of loving, adventuring, exploring, arguing, laughing, sighing, dreaming, cooking, and coffee drinking! I don’t know how many of you know this but, our business name is actually derived from our love story. Part of it comes from the Great Spirit and part of it comes from Mother Earth. Andrew is the fox and I am the owl. 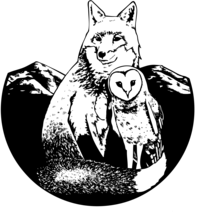 Our business literally came from love and since we surround ourselves with clients who are full of love it seems fitting to share a little bit about where the name Fox & Owl came from. We saw a hawk together (driving to pick up chocolate and wine, no less) and that gave Andrew the go ahead to ask me to be his girlfriend. The first time we said, “I love you” was after we saw a fox together. The first sunrise we watched together was shared, in part, with an owl – which was the go ahead for a proposal. We said our one sentence wedding vow (which is on my arm if you ever want to read it) in a field of ferns in the Pisgah National Forest as our loved ones looked on in a circle around us. It was one of the best days of our lives and we’re thankful to continue choosing each other every day, 5 years later. If you’re curious about the whole story, let’s grab coffee and talk – seriously! We didn’t have an official wedding photographer on our day. I know, I know, I can hear you basic white girling out and gasping “what even? !” We had a few folks taking photos with various cameras – one being the camera we started our business with! Because it’s 5 years, and that’s kind of a big deal, we decided to do an anni shoot right where we got married. It’ll be next weekend and we’re so excited to stand on that ground and breathe in that space again, together. We hope you’ll take the time this weekend to raise a glass with us and cheers to 5 years and many more! Cheers to the next 100 years! And, as we always say, it just keeps getting better.